Virtual reality has been around for a while, but only available to large companies and VR specialists. Until now. Meshroom VR is on a mission. With Meshroom VR Studio, the company wants to democratize virtual reality validation for designer studios, product engineering, marketing and other product-related teams. 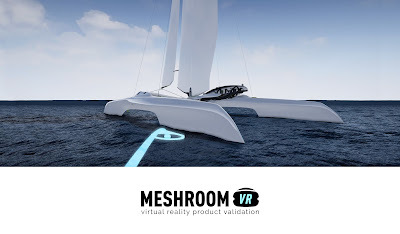 Meshroom VR Studio offers a fast, affordable and very realistic digital prototyping solution. The team is focused on design quality and user experience to produce the most intuitive software. Users can get started fast and work autonomously. Rhino can handle complex shapes where visualizing the result at scale 1 is especially important. Acknowledging the match between Rhino users' expectations and Meshroom VR philosophy, Meshroom VR made sure to support DAE and FBX Rhino generated files in the best possible way. The DAE format is efficient. It allows a super fast export from Rhino and import to Meshroom VR. In just 20 seconds, complex structures over 5M triangles are loaded with their Rhino textures. They can be visualized instantly in beautiful, immersive virtual reality showrooms. Reviewing them with the design team or with the customer is then a real pleasure.